It was called the Watersnoodramp, which in Dutch means "flood disaster"  and it was nothing less. The North Sea flood of 1953 was the result of a high tide meeting an unusually strong storm  the same combination that made Superstorm Sandy so destructive  resulting in a coastal surge that inundated the countries around the North Sea. Lives were lost in England, Scotland and Belgium, but the most severe impact was felt in the Netherlands. The old dikes and other sea defenses built around the Dutch coast proved powerless to stop the surge. Radio stations at the time didn't broadcast at night, when the flood was at its worst, so few Dutch residents living in harm's way received the warning to evacuate, and nearly 2,000 people died after the sea swallowed the coastline. With much of their country positioned below sea level, the Dutch were no strangers to the threat of a coastal storm, but the 1953 flood would prove one of the worst in the nation's history. It was also a turning point for the country. 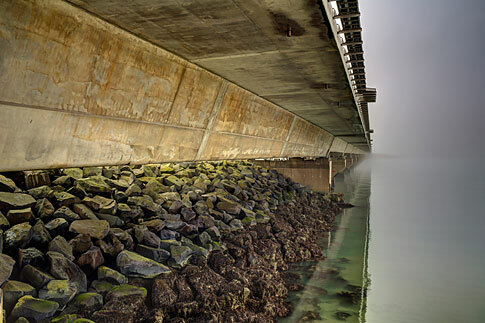 Soon after the floodwaters receded, the Dutch launched an ambitious program to strengthen and extend the seawalls and other defenses that had failed to protect them. That eventually led to the creation of the Delta Works  a $13 billion, 640-km-long system of levees, seawalls, dikes, locks and dams designed to ensure that something as catastrophic as the 1953 flood never hits the Netherlands again. The Delta Works  which features movable parts that allow Dutch planners to keep waterways largely unblocked except in the event of a major storm  is designed to protect the Netherlands from 1-in-10,000-year floods, meaning the country should be shielded from the worst disaster that could be expected over the course of 10,000 years. But climate change is forcing the Dutch to alter their calculations and fortify their protections. Globally, sea levels have already risen by nearly 30 cm over the past century, a rate that is accelerating, and as the globe continues to warm, the Dutch are preparing their country to deal with a 1.3 m rise in the North Sea by 2100. The cost will be high  well over $1 billion a year to heighten seawalls, on top of the $500 million a year the Dutch spend just to keep the Delta Works system running. But the alternative would be to leave their cities unprotected from the higher seas and stronger storms expected in a warmer world. That grim alternative was on full display in New York City in the aftermath of Superstorm Sandy. Storm surges in lower Manhattan reached 4.25 m, shattering a nearly 200-year-old record. The resulting floods inundated cars and buildings, knocked the city's vital subways out of commission and left hundreds of thousands of New Yorkers without power. In the coastal communities of Queens and Staten Island, beyond the dense core of lower Manhattan, the damage was even greater, with more than 40 New Yorkers dying in the storm and its aftermath. Altogether, the bill from Sandy  which affected U.S. states from North Carolina to Rhode Island  is likely to be well north of $50 billion. And New York City, home to the greatest concentration of wealth in the world, will never be the same. There's no way to know just how much man-made climate change might have amplified Sandy. But city planners in New York should have known enough to provide greater protection for the homes, businesses and vital infrastructure built close to a rising sea. That may change in the future, as New York Governor Andrew Cuomo pointed out after Sandy struck. "Climate change is a reality," Cuomo said. "Given the frequency of these extreme weather situations we have had, for us to sit here and say this is once in a generation and is not going to happen again, I think would be shortsighted." New York may be the most recent coastal city to become the victim of a climate-torqued natural disaster, but it's hardly the only metropolis in danger. A 2007 report by the Organisation for Economic Co-operation and Development found that 40 million people  and $3 trillion in assets  live in cities that could be exposed to major 1-in-100-year coastal-flood events, in metropolises like Shanghai, Miami and Mumbai. As these cities boom, so does their vulnerability  the same report estimates that by 2070, 150 million people and $35 trillion in assets could be exposed to major coastal floods. Even if global warming turns out to be less threatening than most climate scientists fear, there will be more people and more expensive property in harm's way of coastal floods over the years to come. Worse, most of that growth will take place in developing nations that may lack the resources to adapt to climate change.